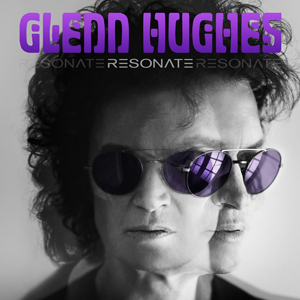 The new Glenn Hughes solo album, Resonate, will be released on Friday, November 4, 2016 via Frontiers Music Srl. From album opener, "Heavy", to the very last chords of the closer, "Long Time Gone", it promises to be a contender for 'Album of the Year' on many a list. It features his live solo band members, Soren Andersen (guitars and co-producer), Pontus Engborg (drums) and newcomer to his band, Lachy Doley (keyboards), in addition to long-time friend and drummer, Chad Smith (of RED HOT CHILI PEPPERS), who joined them in the studio for the opening and closing numbers. It might well be the most heavy sounding of his solo albums, but as is his trademark, musical diversity shines through and as Glenn commented upon completion of the new recording, "this album is the first kind of a complete Glenn Hughes album". No other rock musician has carved such a distinctive style blending the finest elements of hard rock, soul and funk. That astonishing voice is Hughes' calling card and the new album, Resonate will shine as a true Glenn Hughes landmark release. A true vocal and musical icon of our times, in the past couple of years Glenn has concentrated again on his solo career. While touring non-stop throughout 2015, with shows in South America, Europe, UK, Japan and Singapore, sold out crowds were the order of the day. In addition, late in 2015, the Rock & Roll Hall of Fame announced that DEEP PURPLE, including MKIII, were finally to be inducted after several previous nominations over the years. This was a culmination of a 40+ year career which saw Glenn leave his indelible mark in several musical endeavours and bands, including TRAPEZE, DEEP PURPLE, HUGHES/THRALL, his collaborations with Gary Moore, BLACK SABBATH’s Tony Iommi and most recently with BLACK COUNTRY COMMUNION and CALIFORNIA BREED. 2016 was his busiest year yet. With summer festivals and solo shows in the USA, UK and Europe, finally Glenn’s first solo album in over 8 years that will see the light of day! Resonate is truly a triumphant return to form for "The Voice of Rock"! Resonate will be available in two configurations: regular CD and Deluxe Edition including one bonus track, “Nothing’s The Same”, and a DVD featuring a “Making of” album documentary, “Heavy” (music video), and “Long Time Gone” (music video).